I hope it's a huge success and I plan to be along for the ride. Okay, I feel like a fool. I just went to the trouble of creating a Creative Market account, putting a referral on my FB page, etc., only to find that Creative Market does not exist yet! Going back, I see the word "early" interspersed in a few places in the marketing lingo urging people to join. Artists, please beware. 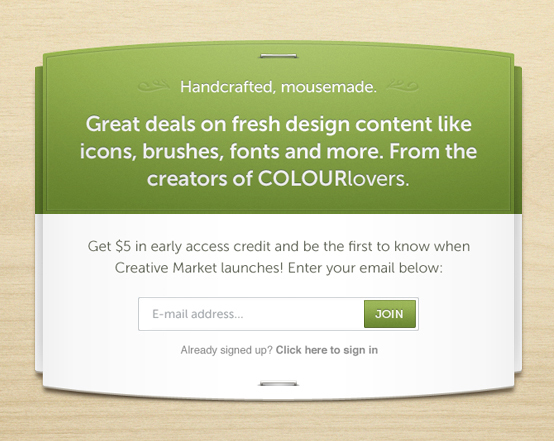 Creative Market is a bridge to nowhere. I'm deleting the referral on my FB page right way. You violated my trust in Colourlovers without making it crystal clear that Creative Market does not yet exist. Trust is everything in an online community. Please do not take it lightly. The site does exist...it simply isn't open for business yet. Lots of businesses promote before they officially open their doors. Maybe I'm an odd man out but I don't see anything wrong with it. I'm glad for the heads-up on this new site. I think it's good because we're being given the opportunity to participate or opt-out. I don't see the problem, really. I wait be quickly to launch! I'm so exciting for be part of it. This is not talking about sales of palettes or coloured in patterns right? Cuz I have no skills in seamless or vector works but i don't mind making some of my patterns / palettes available for sale.. I'm an exclusive vector illustrator on iStockPhoto. If I were to relinquish my exclusivity would I be able to sell my vector illustrations here? What kind of pricing do you expect? If Getty/iSockPhoto offers to buy you out for millions of dollars, will you sell out?